I would like to give a little review on why I am starting to dislike the iPhone 5, and if the next installment aka iPhone 5S does not come with bells and whistles then it might be time to make a harsh decision. Do not get me wrong the iPhone 5 is a lovely phone on the software front, but when it comes to hardware it all goes terribly wrong. I will keep this as short as I can, one thing I would like to say is “Is there any chance the next iPhone will not scratch and chip easy?” To say I am starting to go off Apple and why the iPhone 5 is just an expensive piece of garbage is an understatement and I will explain. When I first got the iPhone 5 I was impressed with the style, it is taller, thinner and much lighter, and as I said above I really love the software. The operating system and the software within is by far the easiest and seeing as most of my products are Apple based it makes it a breeze to sync all iDevices at once. The hardware on the other hand is to be frank “Disgusting”, I have had many smartphones in my time and nothing compares to the iPhone 5 when it comes to chips and scratches, the on / off button constantly gets stuck and takes at least 4 to 5 presses for it to work, and do not get me started on 3G. Ok I said the software is very good indeed but the iPhone 5 still has that dreaded 3G problem, is this fault since the latest iOS 6 update or is it simply down to O2 UK network I am using? Do behave; we know damn well it is to do with the operating system. The iPhone 4S was one of the best Apple smartphone’s to date, the build quality was by far much better than the iPhone 5 and that could take a beating before any scratches etc showed up. As far as build quality goes the iPhone 5 just ticks me off, and Apple needs to get it right with the iPhone 5S or iPhone 6. Comment 1) Only just coming around to this conclusion. Most people realised, with the release of Android 4+, just how far iOS is behind. Comment 2) Not the software? Interesting – To be honest I think that all phones suffer from this, especially if you keep them in a pocket with keys, etc and don’t have a case. 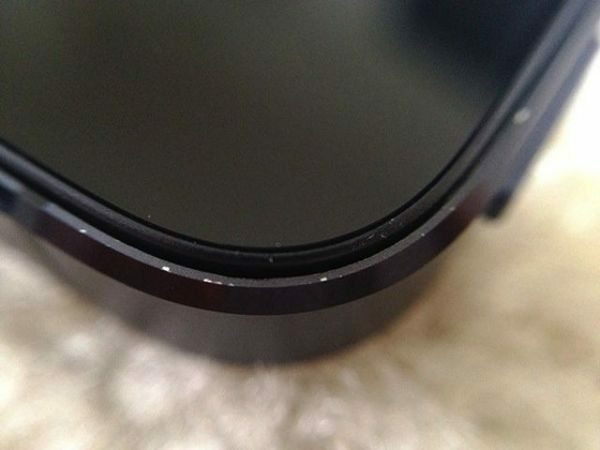 I’ve seen similar examples of previous iPhones with that kind of damage when treated in that way also. Comments 4 & 5) One Google+ follower said that the iPhone 5 scratches too easy IMO, and another said that it is a known issue and Apple will exchange your handset free of charge if you book an appointment, I did this three weeks ago after receiving a couple minor scuffs on the bezel and they dealt with it. To answer comment 5, “Why should we have to go and get a replacement iPhone 5 when we know for sure it is going to happen again, so I get another new phone and then will Apple replace the second or the third? Ok, so shall I just go buy an iPhone 5 Case and cover up Â£600 handsets that are like spending a Â£1000 on nice wooden flooring only but to cover it up with a Â£10 rug? Comment 6) This follower said that they got their new fresh iPhone 5 in a Poetic Atmosphere case with a BodyGaurdz Pure screen protector, oh please shall I cover up my nice shiny new iPhone 5 with a case, if I spend Â£600+ on a new smartphone I want to see it in all ins glory not just the side and back of a cheap case. Comment 7) This one made me laugh a little — The commenter said that they are actually surprised that I still have the iPhone 5 and that most techies don’t like the Fisher price feel of the software and the limitations it brings. To answer comment 7, the iPhone 5 is a great phone for interactivity, syncing, ease of use and does have a clean user interface; I am not here to slag of the software side of things. I use many smartphones on a daily basis such as the iPhone 5, Samsung Galaxy Note 2 and the Samsung Galaxy S3; these are a few phones I very much like. I am starting to feel that Apple has us my the dangly bits between our legs, we buy everything from iTunes like apps, music, movies etc, if an iPhone user since 2007 decides to move onto to the likes of Android they have to start all over again, ouch damn costly comes to mind. How do you feel about the iPhone 5? And even if you an Apple user this is not about slagging it off, be totally honest and let us know how you feel about the hardware. This is not the case of Android users say “I told you so”; it is about the truth and what is really happening. My honest opinion is the best made phone I’ve ever had (and I’ve owned every iPhone since the first one) Very slight chipping of the anodised paint on a bezelled edge both neither that noticeable or that bothersome. Id rather that then a plastic case like the S3 anyday. I quite like the way anodised and power coated metal ages. Can’t quite say the same about plastic. I understand that you don’t want to cover your phone and have it lose its sleek, thin look but cases do protect phones. I’ve been on both sides of this and while I like the look of my phones they will scratch up. I got a decent case that covered the back and had a bracket on the front of my 4s because the 4s is sleek and beautiful sheet of glass. And while I get your flooring example usually people asks their friends to take off their shoes on the new floor. As far as the network speed goes, you can divert your attention to the O2 network. Here in the US, we have 4G LTE networks which offer speeds of 35-40Mbps. The phone can handle more than that, it’s limited to the network. Same thing with 3G – I’m on Verizon and am lucky to crack 1Mbps with that 3G. My sister gets twice as fast consistently with AT&T. It is not the phone. If you do not like the chipping, there are companies which can wrap the phone and you will not notice that it’s on there. I will admit that it is a design flaw with the iPhone 5. I had an iPhone 4 for two years without a scratch on it – the new material is lighter and apparently the chipping is a trade-off for weight. As for the iPhone 5 versus Android – that’s personal preference. I hate the Samsung Galaxy S III and I love pretty much other product they make. Many friends have that phone, and the tap feature (Near Field Communication) never works. It is so cumbersome. The apps are cumbersome. As are the menus. With Apple, it just works, and it works well. Especially with my MacBook Pro, iMac, Airport Extreme, etc. I will never go back to Android. There is nothing that I need that the iPhone cannot do, and I understand that is not the case with some people. Calling it “an expensive piece of garbage” is more than excessive. As to future generations, expect an iPhone 5S with a faster A7 quad-core chip, but the phone itself will most likely have the same case (much like the 4 and 4S). You won’t see a new case for at least another year. I had the iphone 4 and 4s, both were excellent. When I moved countries I had the choice between the 5, and the gs3. I was so disappointed by the specs of the 5, that I went the with S3, it’s a good phone, perhaps a bit big for my liking, and I do miss iOS a little (never thought I’d say that about an apple product). I’ve just moved away from the ATT install to cyanogenmod 10.1, and am greatly impressed at the improved battery life, and will see how it improves functionality. That being said, if Apple pull finger on the Iphone 5s/6, then I may end up going back to them. Maybe. As a person who supports the mobile devices in my company the iPhone is a royal pain. I spend more time supporting a handful of iPhones than I do all of the Android devices. People who don’t have to support an Apple product have no idea how poorly made they really are. One of my users received their new iPhone5 yesterday and it is already going back today due to the button not working. Apple is so far superior in hardware and software it’s not even close. Get yourself a good case, cheapskate! Agee with writer that getting a case defeats the purpose of the beautiful of the iPhone 5. The guy who repaired my shattered screen of my iPhone 4S mentioned that a lot of his customers complained about the black iPhones scratching easily and he recommends the white version. Apple seems to be taking our loyalty for granted. In terms of features, they are losing out to Samsung. My friend who is a high level exec at Samsung, mentioned that his company is very aggressive in innovation and features. Just take a look at their phones, TVs, fridges, air conditioners, etc. they really mean business! Watch out Apple. Don’t underestimate the Koreans, they will do to Apple what Apple did to Sony (for sitting on their laurels and basking in the glory of their market share! Don’t doubt me, I have been a loyal Apple follower since the Apple 2E, and have been resisting the temptation to get a Galaxy S3 or even Galaxy Note 2. I still love to write on screen which I think it makes no sense for me to tap with my bulky fingers.